Inclusions: Private transportation, driver-guide service, taxes, toll, parking. Optional: A licensed expert guide for the Cathedral and museums can be added, if desired. Not Included: Entrance fees to sites you decide to visit. Customize this private Orvieto tour and include a visit to Orvieto Underground or lunch at a winery. 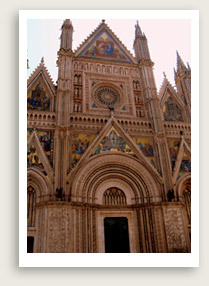 Let us take you on our private Orvieto tour, an unforgettable day trip 90 minutes from Rome. 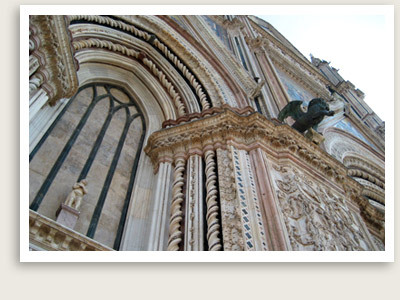 This private Orvieto tour from Rome will take you to one of the most beautiful cities in Umbria. This walled medieval town, dates back to the Etruscan period, 9th century B.C., sits dramatically high up on top of a volcanic rock. It has an interesting old town where the Gothic cathedral is located. It is a delight to explore because it is pedestrianized and very few vehicles are allowed within the old town city center. Your private Orvieto tour from Rome will cover many attractions including its beautiful Gothic cathedral with important frescoes by Signorelli and Fra Giovanni. The city boasts many attractions, to include museums, shops, cafes and restaurants. You may include a visit to St. Patrick’s Well, which is an astounding 175 feet deep, 45 feet wide, and 496 steps down. During the 16th-century Orvieto served as a refuge for the Pope and this extravagant well was built to ensure he had water during a time of siege. Customize your private Orvieto tour to include a tour of Orvieto’s Underground. (Prior arrangements are necessary.) It is interesting to tour the underground city, made up of labyrinth of caves, tunnels, stairs and passageways, unaltered for 2,500 years. Next your private tour takes you to Banoregio, a gateway to the village of Civita di Bagnoregio, for tour of a unique town in Lazio. Founded by the Etruscans over 2,500 years ago, this eroding town has seen its population dwindle to just fifteen residents, earning its unfortunate nickname “the dying town.” You will walk across a 900-foot-long bridge to reach this earthquake-prone village, only accessible by foot.